The Sunnyside addition (the Wedge neighborhood north of 24th St) was marketed as the highest ground south of downtown. In the 1890s, fill from properties in the Sunnyside addition was used to fill in the small lake that floods every time it rains heavy. Thanks, Eric, that makes sense. So, builders essentially just pushed their excavated dirt downhill. I posted another article with more information on this subject — and a quiz — at https://minneapolisparkhistory.com/2012/05/02/comments-on-lyndale-pond-comments-and-a-very-hard-quiz-on-minneapolis-parks/. I recently recieved a note from Bill Payne — who has commented here before and written about Thomas Lowry Park for Hill And Lake Press — that I thought other readers would find interesting. Bill and Suzanne have also been mainstays of Friends of Thomas Lowry Park. With his permission, I’ve copied Bill’s email below. You need the Mr. Sid reader to view it, which is available free from the same site. Actually, it’s one of their products, but free. Anyway, the topo map clearly shows a passage along where Lyndale goes through, although it is elevated above Loring Pond, but lower than the ridge lines to the east and west, and relatively level from where Hennepin crosses, going south. If you follow the map south along Lyndale, there is a low lying area east of Lyndale between 22nd and 24th streets, but this is two blocks south of Franklin. Perhaps this is what your other reader was thinking of. However, the topo lines are only at 20 foot intervals, so you can’t see much detail. I looked up the map and downloaded the software, which is easy. I enjoyed seeing a topographic map that also shows some aspects of development. As Bill noted, not every detail of the map is exact, but it is informative. Thanks, Bill. 1874 A.T. Andreas Illustrated Historical Atlas of the State of Minnesota (Borchert Map library website) appears to show a wet area in that vicinity. Thanks, Adrienne. On that map, the body of water along Lyndale appears bigger than Johnson’s (Loring) Pond. A pond east of Lyndale also appears in the 1883 Cleveland map pictured in the right margin. This map was part of Cleveland’s “Suggestions” for a Minneapolis park system. The park board printed 2500 copies of his report in the summer of 1883 and also included it in the first annual report published in early 1884. The Andreas and Cleveland maps, printed nine years apart, certainly establish that a pond or a marsh existed at roughly Lyndale and 22nd. Can anyone shed light on what happened to it? Did it just dry up as the area was developed? Do people who live in the neighborhood still have wet basements? 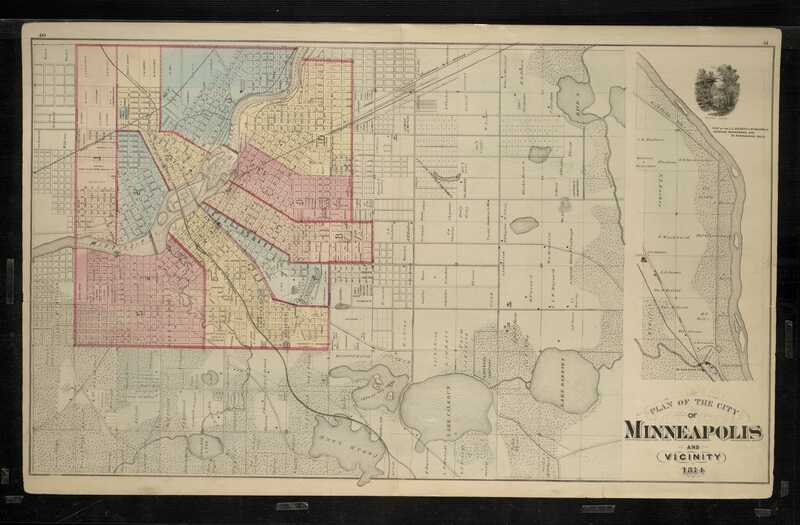 By the 1892 plat map, http://geo.lib.umn.edu/plat_books/minneapolis1892/minn1892index.htm, the pond is gone, but it is interesting that no buildings are shown along the east side of Lyndale between Franklin and 25th. Maybe it was still too wet to build there. While we’re in the neighborhood, does anyone know why there isn’t a 21st or 23rd Street there? 21st exists only between Chicago and Bloomington avenues and between Lake of the Isles and Cedar Lake on the 1892 map. 23rd St. doesn’t exist at all. To my recollection of an early survey/map that I saw years ago, there was a small lake/swamp that encompassed the later intersection. Thanks, Dan. Any idea what happened to it?